With a feeling of Home. 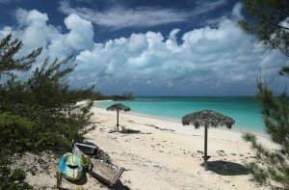 We are a resort on the idyllic island of Cat Island in The Bahamas. Our island is renowned for its totally tranquil atmosphere, its lush natural vegetation and miles of untouched spectacular beaches. All basic or cost saving meal plan as low as $55 daily per person (not inclusive of beverages). 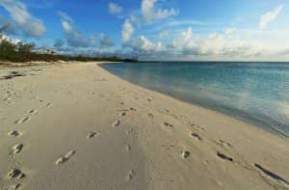 We are an island resort, featuring six individual one and two bedroom villas. All rooms are equipped with air-conditioning, ceiling fans, DVD library along with full bedroom and living room furnishings and a kitchenette with a microwave, refridgerator and coffee maker. 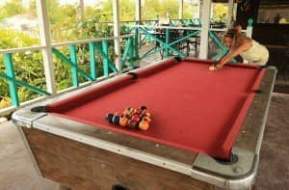 Sammy T’s offers a varied and entertaining schedule of sporting and leisure activities. You decide if you would like to be active on your vacation or simply relax, we have it all here. Our Guest Services staff will be happy to assist you with information on any of the activities requested. 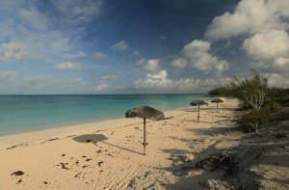 Come an escape for three (3) hours into an untouched paradise where you can swim with the sharks, turtles and rays, snorkel, stand in the shallow turquoise waters and throw out your fishing line or bonefish just for the fun. Get away from the worries of the shoreline and go deep for ½ day or a full day! Fish for groupers, barracudas, dolphins and other wonders of the deep blue sea. Our breakfast menu features mouth watering Bahamian cuisine. Or try our chase eggs, omelets, with all the trimmings topped with fresh fruits and juices. At the end of the day choose from our selection of Bahamian dishes including lobsters, grouper, or conch served with crab and rice or pigeon peas and rice. Or try our international menu. After your morning trek around the island curb your appetite with delicious grilled conch, fish or burgers. Try our fresh salads topped with Sammy T’s secret dressing. Opens 10am – 10pm. Try our special Bahamian drinks and the world famous Kalik beer along with a full selection of wines and spirits. Special champagne available upon request. Book By Date :April 15th – June 10th, 2019. Travel By Date :April 16th – October 31st, 2019. Blackout Dates :April 18th – 21st, 2019; and July 4th – 8th, 2019. Book By Date :April 15th – May 13th, 2019. Blackout Dates :April 18th – 21st, 2019 and July 4th – 8th, 2019. Book By Date :July 1st, 2018 – June 30th, 2019. Travel By Date :July 1st, 2018 – October 31st, 2019. 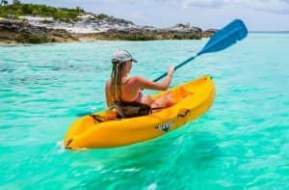 One Free Airline or Bahamas Ferries ticket from Nassau or directly from Freeport (FPO to MHH and BIM only) for PRE-BOOKED 2-night hotel stays OR Two Free Airline or Bahamas Ferries tickets from Nassau or directly from Freeport (FPO to MHH and BIM only) for PRE-BOOKED 4-night or longer hotel stays. NOTE : Additional blackout dates for the special hotel offers may apply. Offer valid for PRE-BOOKED stays at Bahama Out Islands Promotion Board (BOIPB) member hotels only. Limit of one Fly Free or two Fly Free offer per booked room. The Fly Free offer is applicable for Group Bookings of ten (10) rooms or less. 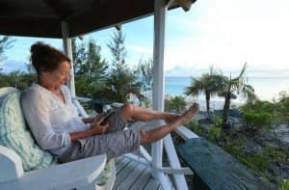 All customers making a reservation must produce – upon check-in – either i) a valid Bahamian passport or a valid Bahamas driver’s license OR ii) a valid work/spousal permit along with a valid photo ID. Persons making the travel reservation must be a part of the travelling party and must be present at the time of hotel check-in. Based on single or double occupancy bookings. Free round-trip airfare transportation only for flights service originating/ending in Nassau or for flights originating/ending in Freeport to/from MHH and BIM. Offer includes all applicable air ticket government and airline taxes and fees. Not combinable with any other air credit promotion. This Fly Free offer is subject to availability and may be changed or cancelled at any time. Other restrictions and limitations may apply. Additional Terms & Conditions for the special hotel offers may apply. PRE-BOOK a 2-night stay and receive a $150 Fee Credit. 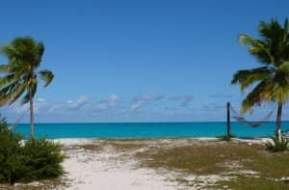 This mystical island’s rolling hills are the highest elevation in the Bahamas. Climb to the top of Mt. 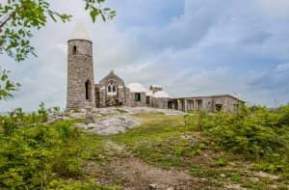 Alvernia where you’ll get a bird’s eye view of a scaled replica of a 12th century monastery called the Hermitage, While the Deveaux Mansion and nearby ruins dominate the coastline. Spent 4 days that went by way to fast. Can't wait to go back, and for more then 4 days. Sammy, Carnetta, the dogs Rusty and Kahlua are perfect. (bring bug replenent). Total relaxation! Sammy is truly the perfect host and Carnetta is not only a wonderful cook, but a true delight! Peaceful, relaxing and gorgeous. We are already planning our next trip! We just returned from a trip to Sammy's on Cat Island. We went for a week to celebrate our anniversary and didn't want to leave. The resort is beautiful and Sammy and his staff are wonderful! The freshly prepared food is fantastic! This is THE place to relax and unwind. The beach and water are clean and clear and the sunsets every night are amazing. Sammy has done an outstanding job with this resort - we cannot wait to go back! We just returned from celebrating our anniversary at Sammy T's. We had never been to the Out Islands and weren't sure what to expect. We had the most relaxing and beautiful vacation that we could have imagined. Sammy, his staff and the Cat Island residents are among the friendliest and welcoming people we have ever met. The resort is beautiful, we had wonderful food and enjoyed our time with everyone we met. It was truly THE PLACE to get away from it all - we hated to leave but look forward to planning our next trip back! My family and I had the great fortune to visit Sammy T's for a fine dinner during our stay on Cat Island this the first week of March. I must say that it was indeed the high point of out stay on this fine island. Sammys hospitality on an island known for just that was delightful. He and his staff went out of there way to accommodate us even though we had not stayed at his place, a mistake I will not repeat. Next trip back to Cat we will be at Sammy's ! "BEST RESORT ON CAT ISLAND"
We stayed with Sammy T over Xmas/New Year 2004/2005. This place is a total paradise! You have your own secluded long beach facing West for wonderful sunsets. Sammy is the most thoughtful host you can imagine. Accommodation/cottages are tastefully furnished with DVD player and all amenities. Great and courteous staff. The food is outstanding - try the stuffed lobster tail. One week’s stay went by like a dream. THE place to relax in the Bahamas! "MY SOUL RENEWED @ SAMMY T'S RESORT"
The brochure for Sammy T's Beach Resort says "Awaken your Soul". That says it all. 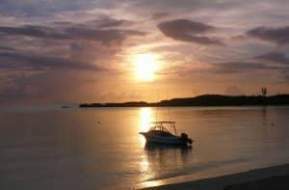 I just recently returned from my first family reunion on Cat Island with a big satisfying & relaxed smile on my face. I will definitely return. Everyone was friendly, the accommodations& food was great and the clear white sand beach was magnificent. Make sure you take mosquito repellent. 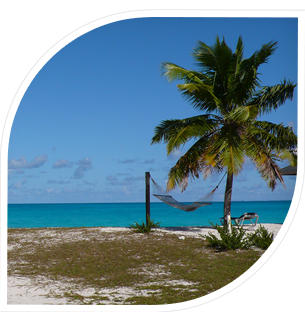 Do yourself a favor, relax your body and mind at Sammy T's on Cat Island Bahamas. 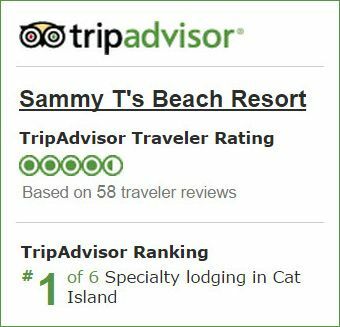 "SAMMY T'S - BEST KEPT SECRET"
Went to Cat Island, stayed at SammyT's Beach Resort. Had a wonderful time, the staff was wonderful, the accommodations were excellent, clean, beautiful beaches, wonderful food right there on site. 4 star rating, will return yearly. Will never forget the place. Airfare: Off-peak periods = $284.25 one way (taxes included); peak periods = $331.25 one way (taxes included). Airfare: Off-peak periods = $329.71 one way (taxes included); peak periods = $376.71 one way (taxes included). upadates to your email inbox.